Combining two different polymer forms allows 3D printing of complex geometries with better mechanical characteristics and better biological adhesion, according to research. That’s compared with manufacturing silicone parts from molding, casing, and spin coating of simple forms. “So far, PDMS (polydimethylsiloxane, or silicone) has limitations in formability and manufacturing of devices,” says Ibrahim T. Ozbolat, associate professor of engineering science and mechanics and bioengineering at Penn State. “Most research is done using casting or micro molding, but this fabrication yields materials with weak mechanical properties and also weak cell adhesion. Researchers often use extracellular proteins like fibronectin to make cells adhere,” Ozbolat says. For any material to serve as “ink” in a 3D printer, it must be able to go through the printing nozzle and maintain shape once it is deposited. The material cannot spread, seep, or flatten or the integrity of the design is lost. Sylgard 184, an elastomer of PDMS, is not viscous enough to use in 3D printing—the material simply flows out of the nozzle and puddles. However, when it is mixed with SE 1700, another PDMS elastomer, in the proper ratio, the mixture is printable. “We optimized the mixture for printability, to control extrusion and fidelity to the original pattern being printed,” says Ozbolat. 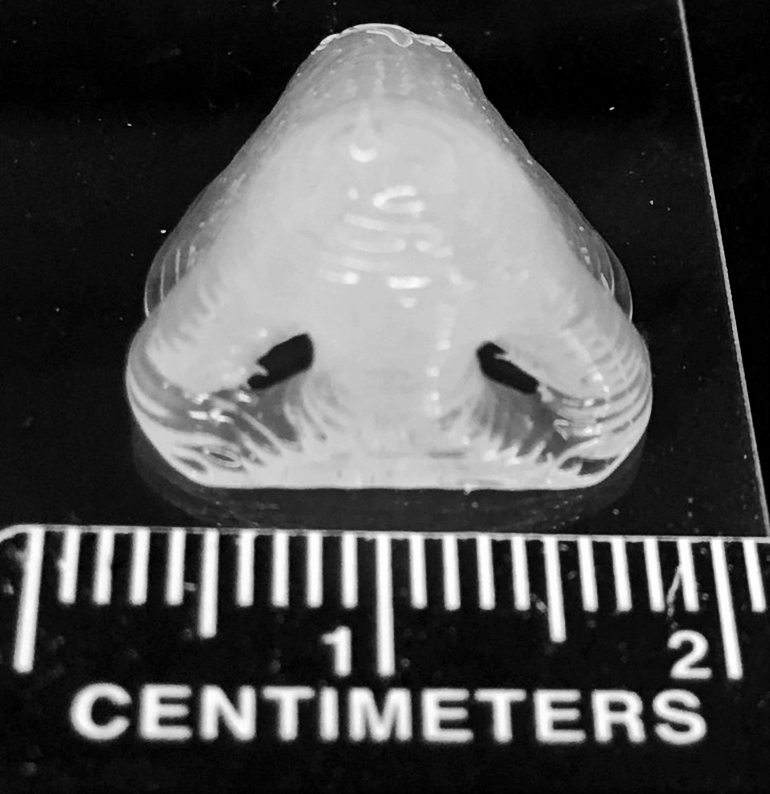 A nose created using 3D printing of PDMS from National Institutes of Health 3D Print Exchange. While most materials become more viscous under pressure, some materials have the opposite, non-Newtonian response, becoming less viscous. This is perfect for 3D printing because a fluid that is viscous enough to sit in the nozzle then becomes less viscous when the pressure of pushing out the “ink” occurs. As soon as the material leaves the nozzle, it regains its viscosity and the fine threads placed on the object retain their shape. PDMS, when molded, has a smooth surface. The material is also hydrophobic, meaning it does not like water. Add those two properties together and the molded surface of PDMS is not an easy place for tissue cells to adhere. Researchers frequently use coatings to increase cell adherence. 3D-printed surfaces, because they are made up of thousands of tiny strands of PDMS, have minute crevices that offer cells a place to stick. 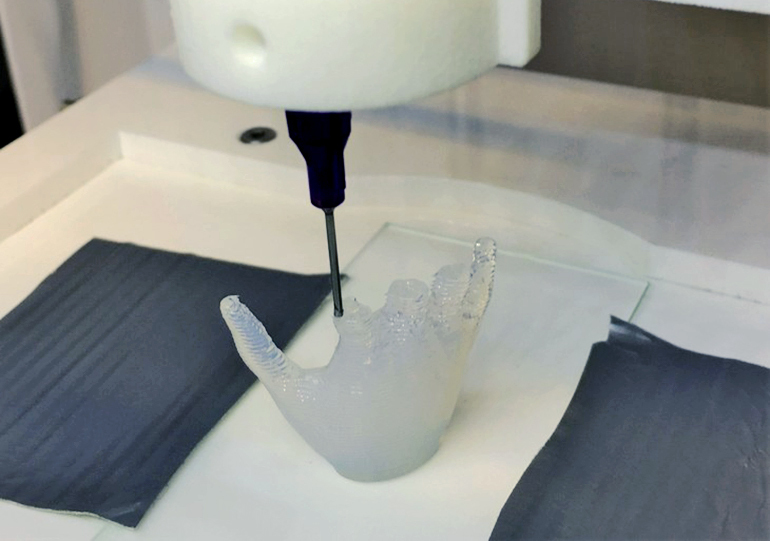 To test the fidelity of 3D printing with PDMS, the researchers obtained patterns for biological features—hands, noses, blood vessels, ears, and femoral head, from the National Institutes of Health 3D Print Exchange. Using these patterns they 3D printed a nose. Organs like this can be printed without support materials and include hollow cavities and complex geometries. “When we compared the mechanical signatures of molded or cast PDMS with 3D printed PDMS, we found the tensile strength in the printed material was much better,” says Ozbolat. The researchers report their results in ACS Biomaterials Science & Engineering. The Scientific and Technological Research Council of Turkey and the Turkish Ministry of National Education supported this work.